Cancer remains a leading cause of death, despite decades of fundamental and applied research in this field. However, early diagnosis, better understanding of disease processes, preventive strategies, and development of new classes of anti-cancer drugs have contributed to improving the survival rate and quality of lives of cancer patients. 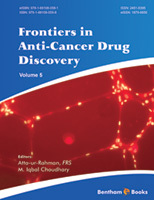 Volume 5 of “Frontiers in Anti-Cancer Drug Discovery” contains well written comprehensive reviews of various aspects of cancer biology, prevention and drug designing. These articles, contributed by leading experts, reflect the diversity and complexity of the research field, and where it stands today. This “must read” eBook is a comprehensive treatise of the state-of-the-art in cancer research. The first two reviews in this volume relate to diet and its relationship to the on-set of cancer. Diet can be a part of the problem, or part of the solution. It can cause certain cancers, and also prevent cancers, depending on what you eat. Cancer prevention by using dietary agents is now one of the most active areas of research. Gabriela Gutiérrez-Salmeán et al review the various dietary components which are associated with increased risk of certain cancers. The authors have provided an interesting commentary on various classes of dietary agents, such as antioxidants, omega-3 fatty acids, and polyphenols which are perceived as cancer chemopreventive agents. The pitfalls of their use as adjuvants and the nonconclusive clinical data, is also vigorously debated. Atanasova and Gatseva have contributed a comprehensive review of the results of various epidemiological studies on the reduced risk of cancers with the consumption of certain functional foods, rich in bioactive substances. The role of various types of carotenoids in cancer prevention is extensively reviewed in this article. Evidences are presented that antioxidant micronutrients of natural origin are far superior in providing cancer prevention than their synthetic analogs. Bassam Abdul Rasool Hassan has reviewed the pivotal role of pharmacogenomics in cancer treatment. It is now well established that genetics plays a key role in the on-set and progression of cancer, as well as the therapeutic outcome. Intra-individual genetic variations directly affect the drug response. Therefore pharmacogenomics is increasingly used in cancer treatment. This interesting review narrates the role of pharmacogenomics in drug selection, dosage, duration of treatment, and safety and toxicity. In silico methods continue to play an important role in drug discovery and optimization. Dutt and Madan review the systematic utilization of in silico approaches in accelerating drug discovery and designing drugs for cancer treatment. They have discussed the effectiveness of various in silico models, and machine learning techniques, employed for the development of novel anti-cancer agents. Ali Zekri et al uncover a novel aspect of cancer biology by reviewing the most recent literature on cancer stem cells (CSCs) as target for anti-cancer drugs. These cells are responsible for the heterogeneity of tumor mass, and are often resistant to standard cancer chemotherapies. The chapter highlights the importance of further studies in this exciting field. The next three chapters focus on two key targets for anti-cancer drug discovery. Drug resistance in cancer cells is a growing threat to the effectiveness of current therapeutic regimen. Efflux pump pglycoproteins (P-gp) play an important role in hindering cancer chemotherapy. Extensive research is being conducted targeting the p-glycoprotein efflux pump. The chapter by Mayur C. Yergeri describes the various classes of natural and synthetic compounds, which can selectively inhibit Pgp and other transporters. Monde Ntwasa has contributed a review on small molecular activators of p53 regulatory machinery, which can serve as anti-cancer agents. p53 protein is down regulated or inactivated in many cancers, and factors which contribute to the inactivation of p53 protein can be targeted to upregulate its expression as a therapeutic strategy. Ningaraj and Khaitan describe the role of ion channels [(Ca-dependent K+ channels (BKca) and ATJP-sensitive K+ (KATP) channels] in brain cancers which unfortunately have poor prognosis, and are often difficult to treat. They have presented the out-comes of their own work on BKca and KATP channels inhibitors which can enhance the delivery of antineoplastic drugs and imaging agents in cancer cells. Agorastou and Tsoulfas have discussed the therapeutic potential of sorafenib, a multi-kinase inhibitor against Raf kinase, as a drug against hepatocellular carcinoma (HCC). Sorafenib can be used in different stages of cancer progression and apparently works as an anti-angiogenetic agent. The use of sorafenib, alone or in combination, and therapeutic outcomes against HCC are extensively reviewed. This volume of the eBook series represents the results of a considerable amount of work by many eminent scholars. We wish to thank them all for their excellent contributions, and their commitment to complete the writing assignments in an efficient manner. We would also like to thank the excellent team of Bentham Science Publishers, especially Ms. Fariya Zulfiqar led by Mr. Mahmood Alam, Director Bentham Science Publishers, who deserve all appreciation.